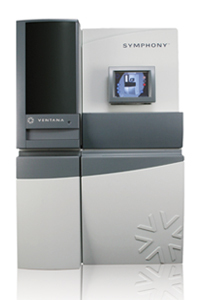 What do you think about the Ventana Symphony stainer? After almost two years of working closely with this stainer, I have seen it succeed and fail. It can make perfect and beautiful slides and can also cover them in a mysterious coat of eosin. It can coverslip hundreds of slides in a row perfectly, and then sometimes coverslip so bad it literally connects two slides with the same crooked coverslip. The coverslips cannot be removed the traditional way, you must use a hotplate and heat them to melt the glue and slide the coverslip off. It will use up your cash as fast as you want, with expensive reagents and coverslips + service. Not to mention constantly replacing the tray racks that just simply were not designed by a histologist, or even tested by a histologist. Clearly they hired an all knowing engineer for testing. Does this sound good? NO. But is this a great machine? YES. Heck yes. After cutting 150 slides at five O-clock in the morning, clipping them into the cute little symphony trays and going for coffee has got to be the closest thing to actually having an automated lab. An automated lab that doesn’t actually take more time from the techs than it gives back. Sure we have microtomes that are motorized. Sure we have stainers that drip reagents onto slides for us. But all these machines do not hold a dimly lit candle to a real tech who cares and wants to do a good job in a timely manner. These machines replace techs, freeing up the HR departments of the burdensome task of replacing techs, when techs are so few and hard to find these days. Not many people choose a life of autopsy, necropsy, hunching over machines, cold hands, risk of chemical/biohaz exposures, or just constantly explaining what histology is after people ask you what you do for a living. For those that do choose it, it is often a life long choice and one that is easily made when such joy is found in your career. Only the automated tissue processor has been a such serious reduction in tech time, a reduction in time that most of us take for granted these days when we arrive in the morning and everything is perfectly processed 99% of the time. Automated stainers do not technically save time because the stain takes the same time on a machine as by hand, but they do cut down on errors and free up time for techs to perform other task. Automated microtomes? When they invent a car that can drive me to work, then they should begin to work on the automated microtome. It is a pipe dream at best to think that we can automate something like a microtome when I still have to cook my own eggs in the morning, or even take my laundry out of one machine and place it in the next to finish the process. Automated embedders? You trust that with your heart biopsy? Humans will be doing the technical work in all fields for a very long time, since computers and machines still cannot learn a single simple little thing unless we spend hours and hours engineering or writing code and painstakingly testing it. So, in conclusion, the Symphony is the best invention for histology labs since the automated tissue processor. You cut the slides, put them on the machine and walk away, waiting until you hear “TAH DAH” come from the speakers on the machine. Yes it actually does NOT sound like every other annoying piece of equipment with beeps and buzzers. It was clearly designed by a creature possessing something called “ears”. The experience of using it when it is working well is so good, it totally counteracts any negativity while experiencing a symphony bad day. If this is something you can budget for, you should go for it. No H&E stainer can compete with this machine. It takes up a decent chunk of floor space, but is well worth it. It scares you when you hear it howl like chewbaca and then jam on a rack of slides, but it rarely does so. It has a thin cable inside of it that occasionally snaps, but it is worth a call to tech support to get a new one installed. Do not think you can throw away your hand staining rack, you will still need it. Do not think you will never coverslip another slide by hand, you will. But this great machine will relax your techs on a daily basis. It will amaze your HR department and make them believe that someday, maybe just maybe, the whole process will be automated and they will just stick a piece of tissue into a machine and it will just write them an email with the diagnosis. No more 10 years of school doctors, no more 5+ years of experience working in a lab or your not worth hiring, no more patients families waiting and waiting, no more researchers constantly trying to steal good techs for evil purposes like curing cancer or even diabetes. You can see from my post here, that the symphony is about so much more than just staining. It is a sign of the times. With its touch screen and cool plastic exterior. It shows what millions of dollars worth of engineering can accomplish in the name of making a sale to a lab. Don’t bother demoing this machine, don’t bother reading about it on 100 different forums, don’t even think about not buying it if you can budget for it. Call Ventana, ask how much, check the budget, that simple. I was against our lab buying this machine, and I am glad I was out voted. I can’t wait to see the next generation symphony.